In her 1988 volume called “The Huckleberry Book,” author Asta Bowen lists 11 species of huckleberry. The U.S. Forest Service says there are a dozen species. The huckleberry is a mainstay understory shrub in the inland forests of North Idaho, Eastern Washington and Western Montana. The berries may grow alongside subalpine fir, mountain hemlock, western red cedar, Rocky Mountain maple and other evergreens. It is common to have bear grass next to huckleberries shrubs with the shiny, smooth bear grass creating a slip hazard for pickers. Flowering currant, mountain ash, snowberry, heath, spirea, fireweed and azalea are other typical plant companions. Huckleberries cover a wide territory outside the Inland Northwest. They are found along the Pacific Coast and in the Cascades from the Oregon-California border all the way to Alaska. The Forest Service said they are also found in Canadian provinces and other states as far east as Michigan’s Upper Peninsula. The best of the berries is known as the “big huckleberry,” which is the name used for two closely related species: Vaccinium membranaceum in the Cascades and Vaccinium globulare in the Inland Northwest. According to Bowen, the globulare species is suited to colder winters of inland mountains and has a more rounded leaf than the one found in the Cascades. The best shrubs grow in sunny to partly sunny areas. A little shade often protects the plants from heat. However, wide-open ski runs and old fire burn areas are known for good picking, too. 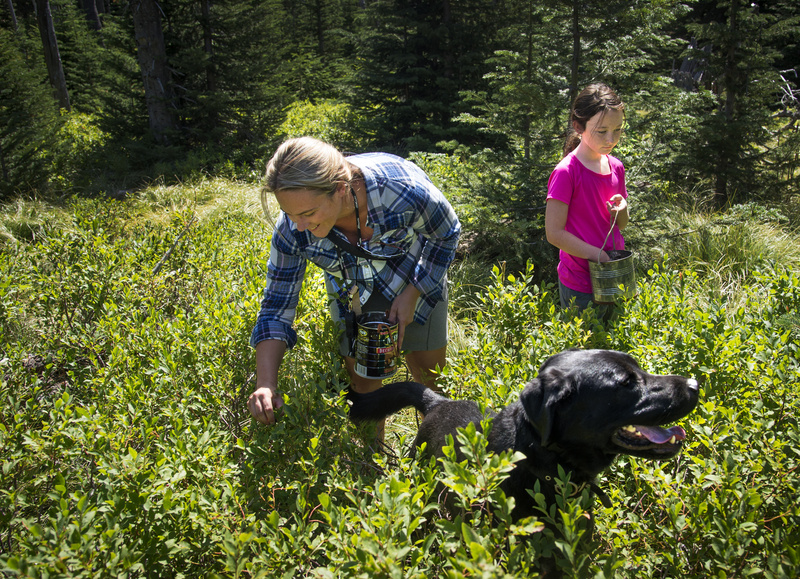 “It’s just a tradition,” said Jessica West, while picking last week at Mount Spokane State Park with her daughter Lauren, 9. Their berry pails were a couple of old coffee cans handed down from grandparents. Huckleberries were a memorable part of West’s childhood, she said, and now she is passing on the tradition to her children. “It was kind of a badge of honor to have purple fingers,” she said. For many, the mountain huckleberry defines Pacific Northwest life, especially in Eastern Washington and North Idaho. But most huckleberry picking occurs up the slopes, often along hiking trails and old gravel roads. “Huckleberry picking is serious business for a lot of people,” said Jay Kirchner, spokesman for the Idaho Panhandle National Forests. People guard the locations of their favored patches, but there are so many berry bushes spread over so much land that finding huckleberries is usually pretty simple. For many locals, Mount Spokane State Park is the closest, easiest place to go for berries even though there are many other locations where the berrying is at least as good or better. In Wallace, the town’s huckleberry festival is set for Aug. 14 and 15. Dig Chrismer, marketing manager at the Schweitzer ski area, said pickers were parking along the ski area access road below the lifts last week. “Everybody has their stashes. They won’t tell anyone else where they are. It kind of reminds me of mushroom hunters in Europe,” Chrismer said. Huckleberries are found all over the mountain at Schweitzer, and that includes the ski runs. The same goes for Mt. Spokane and the 49 Degrees North ski area at Chewelah Peak. Despite the early season, some reports indicate that berry production is spotty in places. Dry areas exposed to sun and heat are not producing as well. Berries may also be small. Franklin Pemberton, spokesman for the Colville National Forest, said one of his favored spots is mostly barren this year. “I am hearing it’s pretty lousy because it’s dry,” he said of the berry picking within the Colville forest. But Inland Northwest forests contain numerous habitats, many of which offer more shade and moisture. While temperatures reached triple digits in the valleys in late June, temperatures at upper elevations didn’t top the 80s. Since this year’s berries have been growing on limited moisture, the huckleberries should prove to be tasty. Other crops are ripening early as well. At Green Bluff, Joyce Hunt at Eleven Acres Farm said cherries and berries were all early. Seed vegetable crops are on a normal growth pace. In town, backyard growers are reporting early tomatoes, peppers, zucchini and cucumbers, among other produce. Huckleberries are so intertwined with Inland Northwest life that it should be no surprise that they are also integral to regional cuisine. Huckleberry cocktails, pancakes, muffins, ice cream, wine, huckleberry ribs and huckleberry sauce over salmon commonly are prepared. But easily, the all-time favorite treatment is the huckleberry pie. “We try to have a pie every year, one straight-up huckleberry pie,” West said while working on getting the quart of berries it takes at a minimum for that pie. Some people refer to huckleberries as purple gold because they’re so prized, and unlike many other local specialties, expensive to get aside from picking them yourself. Consequently, buying picked wild huckleberries can be expensive. A Western Washington company, Northwest Wild Foods, is offering a gallon of frozen wild huckleberries for $89.99 on Amazon.com. They’re available for less at local farmers markets and specialty grocers when in season. On Saturday at a produce stand in Spokane Valley, a gallon cost $50. Kirchner, at the Idaho Panhandle National Forests, said commercial picking there isn’t legal, but commercial harvesters have been so low-key that forest rangers have rarely needed to take enforcement action. Commercial picking is also not allowed on the Colville forest. Kirchner said Idaho is so well-known for its abundant berries that some pickers will travel from Seattle and Portland for the annual harvest. Patches in the Cascades can be quickly stripped because of the larger population on the West Side. Steve Christensen, Mount Spokane park manager, said that despite the number of pickers who make the drive up the mountain, there are enough berry patches in the park to satisfy everyone. A key to success at midseason is to hike to more distant patches. Slope after slope of huckleberries grow near Roman Nose Peak in North Idaho. To the south, plenty of berries are growing in the St. Joe and Clearwater watersheds. The slopes near Grandfather Mountain hold berries. Some of the lesser-known areas may see few, if any, pickers. The areas around Priest Lake, including the upper Priest River watershed, are renowned huckleberry grounds, and that includes mountains near the Salmo-Priest Wilderness and along the road going up and over Pass Creek Pass. That’s where West’s family used to pick when she was growing up, accessing the slopes from Sullivan Lake. “Whenever we went camping, we went picking,” she said.